It is easy to do great deeds, the deeds that bring name and fame. But it is by his small, everyday actions that a man’s character is known. The true karma Yogi does not work to gain publicity. No matter how insignificant his work may be, he throws himself wholeheartedly into the task, because, for him, his work has become worship of God. The reason why I was reminded today of this quote from the famous Ramakrishna-Vivekananda devotional literature is the news of the demise of one of the senior devotees from Ranchi. He was Ranjit Sinha. My Gurubhai too. Rather his entire family had mantra-diksha (initiation) from my Gurudev. I don’t think I have sufficient words to soothe hearts of his wife and daughters as I myself beset with grievance. He was indeed a fort of protection not only to the immediate family but also to many monks and brahmacharins. His influence as I had seen him in Ranchi and elsewhere made a palpable effect on every one who came into contact with him. What I understand now is that he passed away with peace in the heart. He had an inexplicable feeling of his closeness with Holy Mother and Ma would take care of his soul. I recall several meetings with him on many an occasion, his discussions about our Gurudev and what a tremendous faith that he had on him! Well, as a monk I would wonder in those days and continue to do so even now, if only I had one tenth of this house-holder’s faith! In Mahabharata, the narrated story about Yudhishthira is a case in point. When the Yaksha asked him what was the greatest surprise, Yudhishthira replied that so many people die everyday. Yet, human beings want to somehow avoid death. That, he said, was truly surprising. Knowledge again and again gets eclipsed by ignorance! I don’t know how all my Gurubons (Guru-sisters – his wife and three daughters) are coping with. One thing I am sure is that in spite of the irrepairable loss, they would see through the impermanence of this world and its beings as his entire family was nurtured on spiritual insights that he generously provided especially influenced by the spiritual teachings of Swami Brahmanandaji. His home looked a veritable temple. Not only he saw to the external neatness of the place but also insisted upon noble vibrations of thoughts. “The Eternal Companion” was his favourite book. He used to discuss passages from this book with me and we both would forget how the time passed. He would never let go an opportunity to serve sadhus. However, is ‘Death’ to be dreaded or be desired? How many can get a host of monks and brahmacharins around them during death? Here is the touching account of one of his daughters who wrote to me in detail the ‘preferred treatment’ that her father got. Was this due to his extraordinary devotion? “He was on ventilation since 29th Nov ’13. He was taken to Morhabadi ashram at 9.30 pm and 10-15 sadhu-brahmacharis chanted shanti mantras and Revered Shashankanandaji offered charanamrit and Thakur’s nirmalya. On reaching home at 10.30 pm we found 3-4 Swamijis including Revered Prayag Maharaj from Sanatorium were already waiting. They then recited verses from Bhagawad Gita. At 2 am we all started for Kolkatta for cremation at Cossipore Ramakrishna Mahaasmashaan (Grand Cremation-ground). We arrived there by 11.45 am and to our surprise we found therein Srimat Swami Vagishanandaji Maharaj waiting for us. And at 7 pm my father passed away. What a glorious divinely demise that this wonderful devotee had! Many thanks for the moving post written with so much sensitivity and love. I wish the question of death becomes an integral part of our education. One cannot help but notice how the topic is avoided even by Hindus to whom death is simply an inevitable part of the process of evolution and reincarnation. I appeal to Maharaj to address this matter in further posts. Death education is as important as the education in any other aspect of life and living. My condolences to the bereaved family and associates of the departed soul. It is true that we do lack, what you call “death education’. There is an art as in Life in Death too. To most of the public, it has become a dreaded thing even to think. Your suggestion seems to be appropriate to ‘address this matter in further posts’. 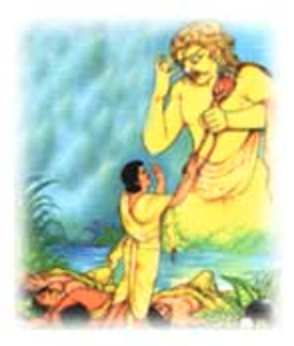 Felt blessed by reading this wonderful story of this devotee of Sri Thakur. Instilling enormous faith in us and also giving joy! I am glad to welcome you to this weblog! If this particular post has ‘instilled enormous faith’ in you as you described it, I am humbled. 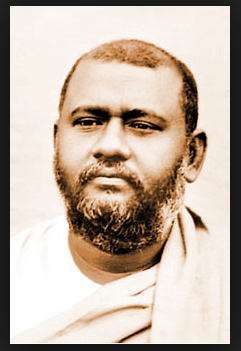 May the blessings of Sri Ramakrishna be on you and your family is my prayer! My condolences on your loss and to the family. Having lost my great father in November as well, I know how blessed he was to also have the prayers of you Maharaj, Swami Saradaprabhanandaji and Ishtaprana Mataji throughout his illness. The presence of Mataji at the hospital during his illness meant so much to us. I must place on record my heartfelt gratitude to All of You for carrying me through this time. I pray that at my time of death I could be afforded the same blessing by Master’s Grace. I can very well see rationality of your emotional involvement with this post. Amidst the multiple news of different types of fearful deaths that we are accustomed to receiving day in and day out, the exemplary ones such as Ranjit babu’s case and also your dear father’s case shine as uncommon. Whenever we receive any ‘bad’ news of our devotees, we do sit in our meditation and earnestly pray for the amelioration of the sufferings. Here I cannot but recall the sweet love and affection that your father had expressed for me all these years. Even at a later stage when he was unable to walk even, he had come to listen to my discourse at Sri Sarada Devi Ashram, and I would always be greeted with a broad smile and cheerful heart. Regarding your wish I have this much to say. Whether the ‘preferred treatment’ comes or not, the remembrance of Master-Mother-Swamiji trio at the time of leaving this body is what is most desirable. On behalf of my family I convey our sympathties to our beloved family in Ranchi. Thakurjee’s grace is clearly limitless. Thakurjee’s love for devotees is very apparent. This article serves to remind us householders on the importance of being a humble devotee. Humility is an unquestionable trait to reach god. The chanting of the peace mantras reminded me about the inner joy we felt when our beloved Akhila Maharaj taught us the peace mantras. My 2014 resolution is to learn the peace mantras taught to us at the Vedanta Retreat and to read a verse a day of the Ishopanisad. Thank you Maharaj for arranging the yoga classes conducted by an inspired devotee like Dr Jotireka Premraj. The practice of yoga as a lifestyle was taught very well. Our teacher awakened the importance of creating a spiritual vibration wherever we are and within us. This conversation was between Keshab and Master on 1st January 1881. Through this post pujya Swamiji Vimokshananda maharaj teaches us the qualities of a great devotee. How a devotee should have love and extraordinary devotion towards Holy Mother and Master and tremendous faith on Gurudev, utilizing every opportunity to serve the human kind. And also, how one should develop noble vibrations of thoughts by associating with holy people and by reading noble books and continuous doing of spiritual practices. You have briefly enunciated the gist of my post! They are always preserved (remembered) through ages. Well said…but my post is about dying in a divine way and not about transcending the death! It gives a lot of hope for house-holder devotees like us to know about such noble people. My father’s mother and my mother’s mother both died chanting their chosen ideals’ names and taking Ganga water before they passed on. My grand mother on my mother’s side died in Sarada Math surrounded by Matajis praying on her bedside. She was chanting the name of Ramakrishna loudly before she took her last breath. Unless the mind is trained from a young age, it is said, that it is difficult to remember God’s name during death. Thank you for posting this thought provoking article! Well, its always inspiring to come to know more of devotees’ experiences. You are indeed blessed to have come in such a lineage. Yes, its a scripturally accepted tenet that thought of God does not appear unless the mind is trained from a young age. In Bhagavad Gita, Bhagawan Shri Krishna says that for this reason He wants us to remember Him all the time (satatam). The result of such constant remembrance is God becomes “available easily”. May we strive to hold Him in our memory always! What a touching article, What a Divine Soul, only an unselfish Soul can have such a Divine send off (such is the Grace of Thakur)! Many lessons to be learnt from this article, I hope Thakur can help me master some of them. Along with learning how to die in a divine way, I also learned how to live in a divine way so that we can die in the same way reading this article of yours. A great lesson that I learned today. Rightly said, my daughter! The society teaches us the art of living but avoids teaching the art of dying. There are many reasons for it though. Yet our scriptures like Bhagawad Gita clearly spells out the art of dying too.